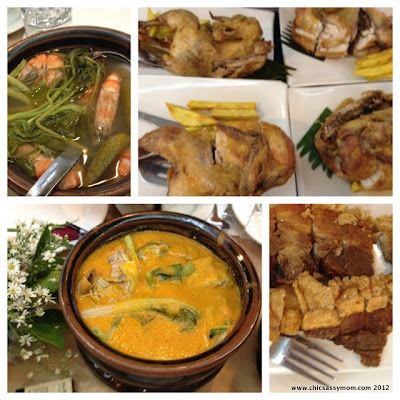 Mother's Day is just in a week's time, and Max's Restaurant, home to the world's famous Sarap-to-the-Bones' (good to the last bite) Fried Chicken, is taking the already exceptional dining experience a notch higher, by concocting a pampering treat for moms this Mother's Day. Bent on ensuring that diners will have an exciting and unforgettable experience on Mother’s Day, Max’s Restaurant has partnered with global cosmetics and beauty brand Body Shop in coming up with a heartwarming surprise for the most special woman in our lives. 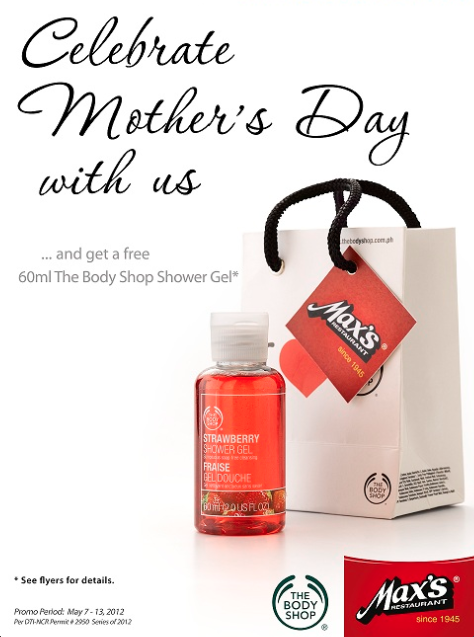 Mechanics: Starting May 7 -13, 2012, family members who will be celebrating Mother’s Day at Max’s Restaurant with a minimum spend of PhP 1,300 will be receiving a luxurious bottle of Body Shop’s Shower Gel... soap-free, lather-rich and fruit-infused! It’s the perfect gift to pamper MOM on her special day. Read detailed promo mechanics here. Attendees of the Press Lauch, Mommy Bloggers and other Media representatives, were treated to luncheon feast for an early Mother's Day tribute. 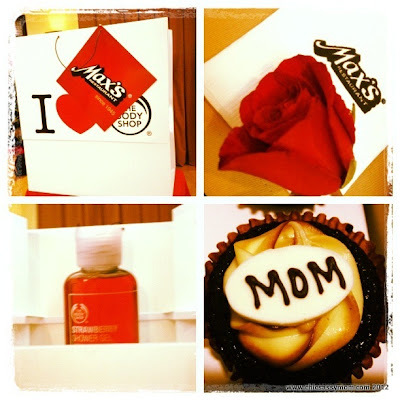 Guests were gifted with flowers, The Body Shop goodies, Cupcakes from Max's Corner Bakery, and Gift certificates. Max's Assist. 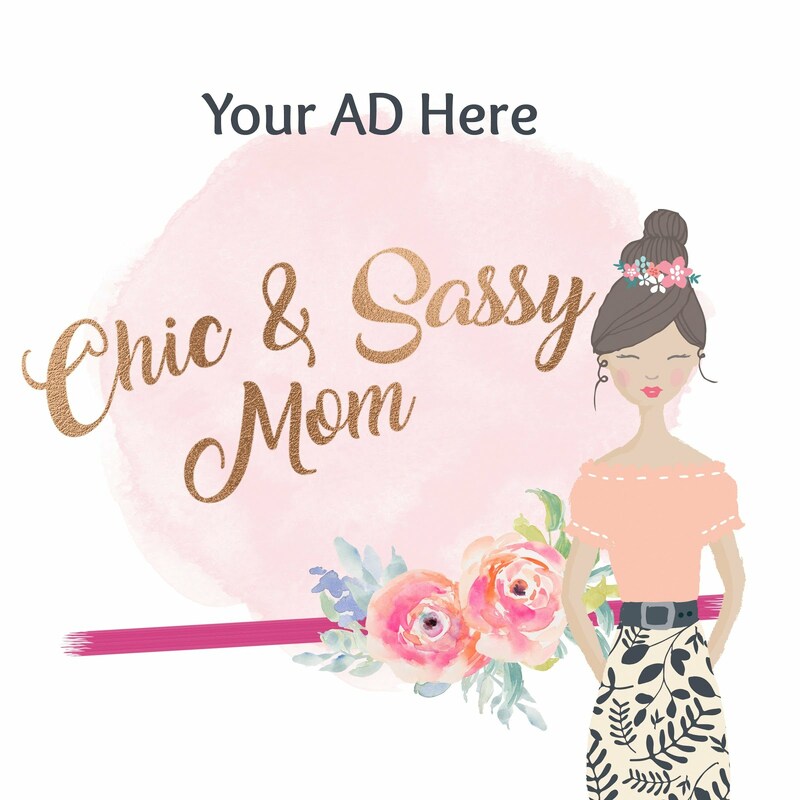 Marketing Manager for Dine In and Take Out, Ms. Cathy Perez-See, and Max' s Assistant Marketing Manager for Regional and Franchise, Ms. Jessa Bien, Celebrity Mom Lyn Ching, and Ms. Rolyn Tumbaga, Corporate Sales and Business Dev't. Mgr. 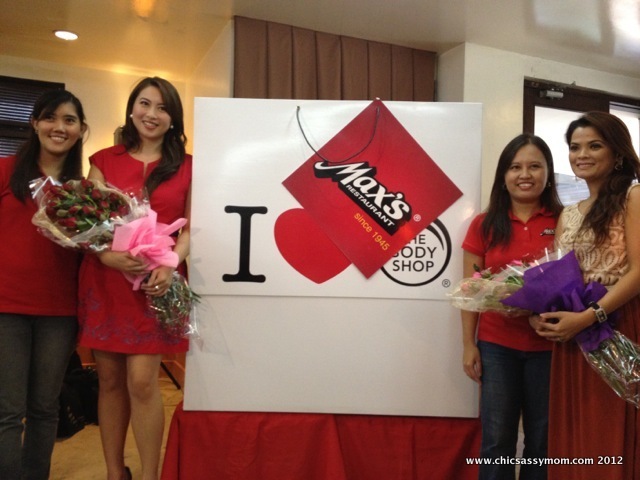 for Body Shop Ph, joined in the unveiling of the Mother's Day promotion in store for diners. Starting May 7, Max's Restaurant is further enjoining us to savor the home-cooked goodness of Max's signature dishes. Let's celebrate everyday meals and special occasions at Max's. 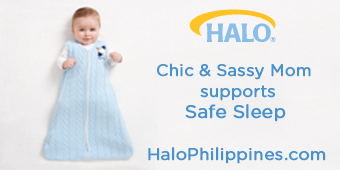 The promotion is available at Max’s branch nationwide. ayan! may hawig kayo ni lyn ching!